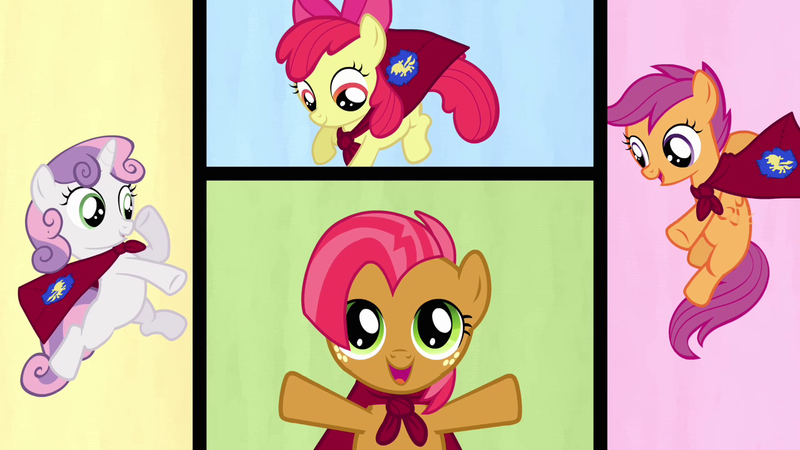 The Cutie Mark Crusaders are four cute little ponies who have strangely not yet received their Cutie Marks, marks which will show their purpose in life. Their lack of Cutie Marks is strange, as all their peers have received theirs. But the reason for this lack is clear - once they get their Cutie Marks, everyone will recognise them. For the Cutie Mark Crusaders are the harbingers of the end times. They are in fact the Four Horsemen of the Apocalypse. It's not that strange. My Little Pony is a television show made in a Christian country. Of course it would be rife with culturally relevant imagery. But this goes deeper into the very plot itself, and points towards the future of the show. Whenever there is a plague in Ponyville, Apple Bloom is at the centre of it. Her first major appearance coincided with the dreaded spread of Poison Joke, and it was only through her intervention that it stopped. Later, she became patient zero for the Cutie Pox. It is perhaps suspicious how the Apple family's apple trees remain so healthy and disease-free, almost as if they are being spared somehow. And of course, we never know how her parents died; it would not be surprising to learn if it was from some sort of disease. The introduction of Babs Seed introduces conflict into the world. She causes the Cutie Mark Crusaders to fear, instigating conflict in a world where there was none. Then she teams up with the Crusaders to war against their bullies. Every interaction Babs has with every character revolves around conflict and the creation of more strike, setting pony against pony. In the Bible, War was represented by a red horse, the rider "granted to take peace from the earth". Babs certainly is red, and takes peace from Equestria! Whilst Scootaloo's more brusque demeanour may be evidence for a bullish personality, it is really her actions in the episode 'Bad Seed' that prove Scootaloo's destiny. In this episode, she deliberately cuts the brakes of Bab's carnival float, causing it to career off a cliff. In this moment Scootaloo does something that no other pony in the history of Equestria has done - she invents the concept of attempted murder. Scootaloo literally brings death into the world for she is the end of all things. Yes, Sweetie Belle shows supernatural acumen in pie-eating in the episode 'Sisterhooves Social' but her role of famine goes deeper than that. In the book of Revelations, we are told that "I heard something like a voice in the centre of the four living creatures saying, “A quart of wheat for a denarius, and three quarts of barley for a denarius; but do not damage the oil and the wine.”" Famine is more about starvation, it is about the destruction and loss of material goods and the damage caused by the class structure, as the holdings of the poor are destroyed (ruining the wheat and barley) but that of the wealthy are allowed to prosper (the oil and wine). Sweetie Belle's interactions with characters continue to further the class gap in Equestria. where there was none, now it widens, causing damage to the once-serene Equestria. She constantly destroys her sister's fashion work when she is making clothes for the masses, but is absent whenever Rarity makes high-end merchandise for the elite. She lauds Twilight's ascension to Princess as something special that puts her above the 'mere mortal' common ponies. She is a destructive dervish, but only for things beholden by the lower classes. Is it any coincidence that once the Four Horsemen are finally together in the episode 'Bad Seed', Sweetie Belle paints herself gold in celebration of the Golden Calf from Christian legend, a false idol against God? And their first act is to destroy a gigantic apple by driving it off a cliff. In the Bible, the apple is the symbol of God's sacred knowledge. They have declared war against Creation itself. When the Cutie Mark Crusaders get their Cutie Marks, the final crusade will have begun and the apocalypse will be upon Equestria. The introduction of Babs Seed introduces conflict into the world. You forget Discord, Nightmare Moon, Chrysalis. There was conflict before Babs.